ORLANDO – John Wesley had one overriding fear: that the Methodist Church would become a dead church. 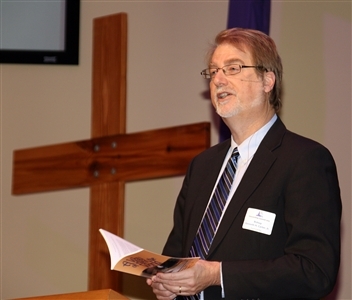 It’s a comment many United Methodists have heard before, but Florida Conference Bishop Ken Carter reminded more than 200 clergy and lay members attending the Florida United Methodist Foundation’s Stewardship Summit of Wesley’s concern during his keynote presentation March 9 to the group. Bishop Ken Carter delivers the keynote address on financial giving at the Florida United Methodist Foundation's Stewardship Summit in Orlando. Photo by Tita Parham. Carter shared seven core principles of discipleship and stewardship. He said Wesley feared that Methodists, who had been predominantly poor, would in time attribute improvements in their lives to their own accomplishments instead of God’s grace and thus give less to others as a result. Carter's description was part of the fifth principle: The rich can be a blessing. From the first listed principle, that giving begins with grace, to his last, that Christians should strive to be a return on God’s investment rather than worrying about getting a return on their investment, the bishop's presentation stressed that stewardship is essential to church health and vitality. “A little bit of good work in this area can be a huge lever for good in the lives of people in the church and, by extension, to the community [to which] the church relates,” Carter said. The summit at First UMC, Orlando, featured workshops and presentations by speakers from Florida and beyond. Click on the play button below to see an excerpt of Carter's address.